I love surprises! (Who doesn't, right?) One of the many perks of being married to a cake designer is my annual surprise birthday cake. Unfortunately, we couldn't observe our tradition my past two birthdays because our lives were too hectic with moving preparations for the first one, and this year, we were completely occupied with opening the shop. In both cases, it was a mutual decision to not do my surprise, and it was a missed opportunity for both of us - a gift that was lost, for both the giver and receiver. Having missed out on both of my birthday surprises, I was excited when we received the order for Rory's Las Vegas themed birthday cake, which would be a surprise gift from his family. Rory and his family were flying in to Las Vegas to celebrate his 26th birthday, and were taking him to dinner at the uber popular Tao restaurant. This lucky combination of factors added up nicely - super nice clients to work with + surprise cake + an artistic Las Vegas theme + delivery to Tao = Jackpot! I worked with Rory's mother and sister to plan his surprise cake. 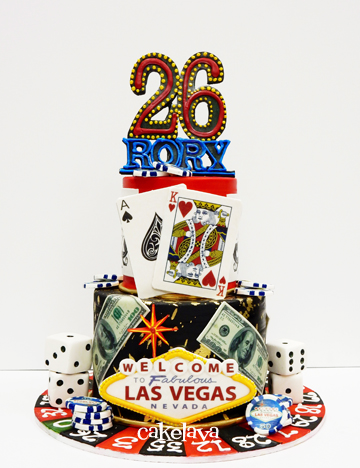 They provided us some photos for inspirations and requested a Las Vegas gambling theme, specifying the games Rory enjoyed playing and some of the elements they would like to see on his cake. We knew how special this cake was to them. They gave as much thought to the flavors of the cake as the outside, and after careful consideration, they chose our Peanut Butter Fudgey and Neon Lights flavors. Rick worked hard on the Las Vegas cake and looked in his element when he was making all the decorations. He wanted the cake to be a surprise the family would always remember! I could see how satisfied he was to be making a Las Vegas themed cake - in Las Vegas! He's made many before, but it's a little different making Las Vegas themed cakes when you are in Hawaii. I'm happy to say that Rory wasn't the only one who was surprised the night we delivered his cake to Tao! Our clients left the entire design of the cake up to Rick. Witnessing the reaction of the client upon seeing their cake is always the best part and I was lucky enough to see Rory's mother's face when she first saw his cake. Her face lit up and she looked ecstatic - the surprise was a huge success! We were told after the party that the cake was loved not only by Rory and his family but by many of the diners at the restaurant who approached their table and asked about the cake. What's higher than Jackpot? Is there a double jackpot, because I think we just won it! cakelava Las Vegas is on Instagram!